The object that smashed into earth to create the moon was far smaller than thought, a new simulation has shown. Researchers at the Paris Institute of Earth Physics tested over two billion combinations of parameters to try and solve the mystery of how the moon formed. The key, they concluded, was an impact with a body roughly one-tenth the mass of Earth. Astronomers have long suspected that the moon was created when a giant protoplanet called Theia struck the newly formed Earth - a theory first put forward in the 1970s. It says the huge collision created a vast cloud of debris, which coalesced into the moon. However, until now, astronomers have not been able to explain how this left the moon and Earth chemically identical. This led to two other ideas, which predicted dramatically different masses for the impact object. 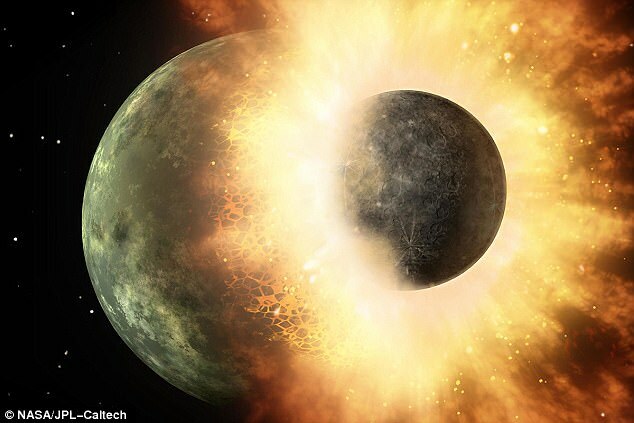 In one, two half-Earths merged to form the Earth-moon system, and in the second, Theia was a small, high-velocity projectile that smacked into a larger and fast-spinning young Earth. To try and solve the mystery, James Badro at the Paris Institute of Earth Physics decided to his colleagues set out to determine how each idea matches up with our planet's chemistry. 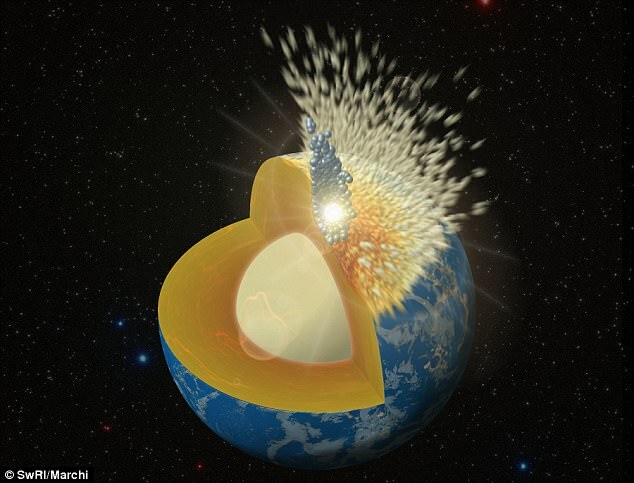 'We know that the giant impact occurred within the first 100 million years and that the impactor, regardless of whether it's a small impactor or a big impactor, must have left a chemical imprint in the Earth's mantle,' Badro told New Scientist. The chemical imprint differs depending on Theia's mass. 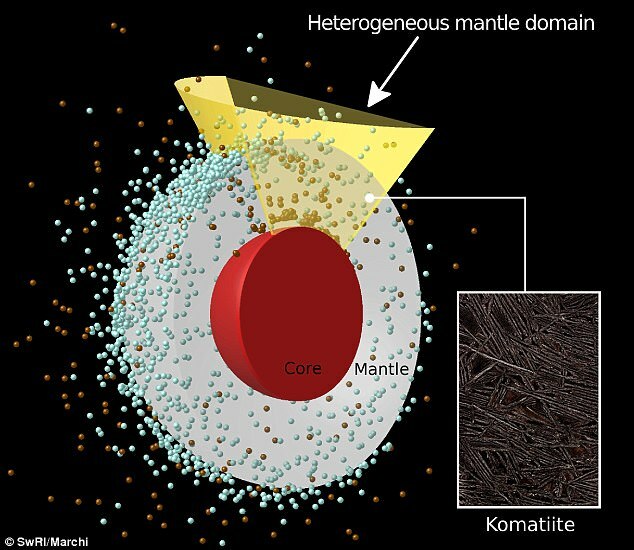 The researchers ran more than 2 billion simulations of the crash, and found an impactor larger than 15 per cent of the mass of Earth, couldn't produce the chemistry we see in Earth's mantle, instead leading to a mantle far too rich in nickel and cobalt. Later, two different hypotheses arose that could explain why the moon is Earth's chemical clone, but they predict radically different masses for Theia. In one scenario, two half-Earths merged to form the Earth-moon system. But the second hypothesis suggests Theia was a small, high-velocity projectile that smacked into a large and fast-spinning young Earth. A separate study recently found shortly after the creation of the moon, the Earth was bombarded by small planets that brought several precious elements to our world, a new study has revealed. These moon-like objects brought elements such as gold, silver and platinum directly to the core of our young planet - as well as substantially contributing to its overall mass. The findings shed new light on the evolution of Earth 4.5 billion years ago. At the dawn of time, Earth collided with a large object the size of Mars, and the debris ejected formed the orbiting moon. This was known as the giant-impact hypothesis, or the Big Splash. Now, a simulation created by researchers from Southwest Research Institute in Colorado has found that after this massive impact, there was a long period when leftover mini planets called planetesimals pounded the Earth. These rocks varied from the size of a grain of sand to lumps 3,000 kilometres (1,900 miles) across, writes Cosmos Magazine. When a planetary system was forming, a cloud of dust was gradually pulled together by gravity to form small chunks. 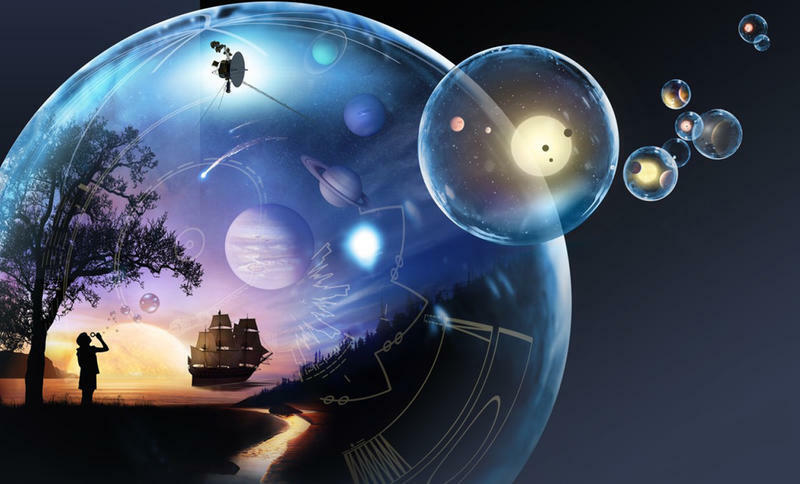 Planetesimals are then thought to have coalesced to form Earth and the other planets. This bombardment, the so-called 'late accretion,' was when large bodies impacted the Earth delivering materials that were integrated into the young planet. Lead author, Dr Simone Marchi explained: 'We modelled the massive collisions and how metals and silicates were integrated into Earth during this 'late accretion stage,' which lasted for hundreds of millions of years after the Moon formed. Previous studies estimated materials from planetesimals integrated during the final stage of terrestrial planet formation made up about half a percent of the Earth's present mass. This is based on the concentration of highly 'siderophile' elements - metals such as gold, platinum and iridium, which have an affinity for iron - in the Earth's mantle. But these previous estimates assumed that all highly siderophile elements delivered by the later impacts were retained in the mantle. The new study suggests late accretion may have involved large differentiated projectiles which may have concentrated the highly siderophile elements primarily in their metallic cores. The new high-resolution impact simulations showed substantial portions of a large planetesimal's core could descend to, and be assimilated into, the Earth's core, or ricochet back into space and escape the planet entirely. Both outcomes reduce the amount of highly siderophile elements added to Earth's mantle, which implies that two to five times as much material may have been delivered than previously thought. Dr Robin Canup, co-author of the study, said: 'These simulations also may help explain the presence of isotopic anomalies in ancient terrestrial rock samples such as komatiite, a volcanic rock. 'These anomalies were problematic for lunar origin models that imply a well-mixed mantle following the giant impact.